The Original Wheelgirl: I Cased Myself! 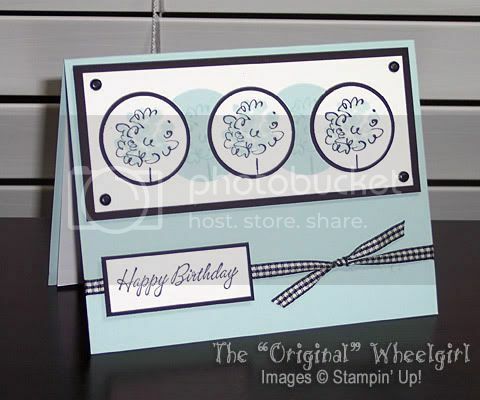 I was so happy with the way that my friend Carmela's birthday card came out I decided to repeat the joy for my best friend Patsy's 35th birthday which is this coming Saturday. The only difference is that instead of Pretty in Pink and Chocolate Chip I used Soft Sky and Basic Black (all colors from Stampin' Up!). Plus the ribbon is the narrow black gingham ribbon from SU!. I love it when a plan comes together...Happy Birthday Pats! You'll always be older than me...heheehehe! My grandma's 90th birthday is March 20th, and I'm thinking of this same card design in Pale Plum and Perfect Plum! I think it will be GORGEOUS so look for that in the next few days.